Learn how to get $150 Credit on Samsung Galaxy TabS4. See offer details. 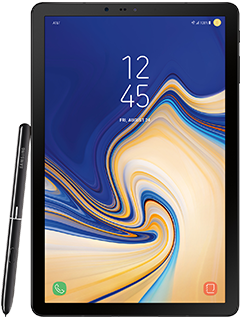 $150 Credit off Samsung Galaxy Tab S4: Limited Time Offer. Elig. Smartphones: New Samsung Galaxy S10, S10+, S10e, Note9, S9+, S9 or S8 Active on AT&T Next or AT&T Next Every Year installment agmt. Elig. postpaid svc (voice & data) req'd (min. $50/mo. for new svc with autopay and paperless bill discount. Pay $60/mo. until discount starts w/in 2 bills. Existing customers can add to elig. current plans which may be less). If svc is cancelled, remaining installment agmt balance is due (up to $1600). Tax due at sale. Down payment may be req'd. See att.com/next for details. Eligible Tablet: Req's new Samsung Galaxy TabS4 on 20-month 0% APR monthly installment agreement and eligible postpaid svc (voice & data) req'd. (add to select existing multi-line plans for $20/mo., or minimum $14.99/mo. on a new eligible plan). Well qualified credit may be req'd. If svc is cancelled, remaining installment agmt balance is due ($750). Tax due at sale. Down payment may be req'd. Both smartphone and table must be activated on same wireless account. Limit: Purchase limits apply. Limit 1 credit per qualified device purchases. Bill Credit: $150 Bill Credit will appear on wireless bill within 3 bill cycles after all requirements have been met. Must keep account, phone, tablet & service active & good standing for 14 days after activation. Credit applied within 3 bill cycles. Offers, pricing, terms & restr's subject to change & may be modified, waived or terminated at any time without notice. GEN. WIRELESS: Subject to Wireless Customer Agreement at att.com/wca. Service not for resale. Deposit: Service deposit may apply. Limits: Purchase & line limits apply. Credit approval, activation (up to $45/line) and other fees, advanced payments and other charges apply. Other Monthly Charges/Line: May include taxes, federal & state universal service charges, Regulatory Cost Recovery Charge (up to $1.25), gross receipts surcharge, Admin. Fee, & other government assessments which are not government required charges. See your plan details and att.com/additionalcharges for details on fees & charges. Coverage & service not available everywhere. You get an off-net (roaming) usage allowance for each service. If you exceed the allowance, your service(s) may be restricted or terminated. International and domestic off-net data may be at 2G speeds. Other restrictions apply & may result in service termination. AT&T service is subject to AT&T network management policies, see att.com/broadbandinfo for details.